If you are looking for a low budget gaming mouse than look no further than the TeckNet Raptor gaming mouse. It will cost you no more than $10. It is the perfect cheap gaming mouse for someone who is new to gaming accessories or someone, who is looking for an affordable gaming mouse. It is the perfect cheap gaming mouse for someone who is new to gaming accessories or someone, who is looking for an affordable gaming mouse. 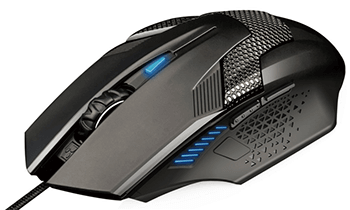 With its attractive price range , the mouse seems to fall short on multiple features mice of higher price range offer , needless to say , the mouse stands its ground and is excellently built for a budget gaming mouse. The first game I played with TeckNet Raptor was DOTA 2 , the mouse has 6 buttons which easily accommodated most of my active item hotkeys , thus taking the load of my keyboard , the mouse seems to perform well under pressure and offers excellent control , the mouse seems a bit out of place for a palm-grip user such as myself , but soon the I got used to its rather wide palm area , and I was back to playing my normal self. As stated earlier, the mouse sports 6 buttons. The one on top, between left and right click, works as DPI switcher. You can switch DPI directly from the button in three different levels. There are 2 buttons on the left side for Page Up and Page Down. You can map them for games accordingly. The regular buttons for left and right click do give a bit sticky effect. However, this much can be expected from a low budget gaming mouse. Considering the price factor, I think this can be compromised too. The TeckNet Raptor is designed to give gamers an affordable gaming mouse. Its design is somewhat comfortable. The braided long cable, illumination and added weight add up to its professional look, and also add in an appeal most mice of its price range fails to live up to. However, Neither design nor illumination is perfect. I often ended up pressing “Page down” unintentionally due to the wrong placement / idea of the button. The light source can also be seen from outside through certain angles. If you use high-quality gaming mice for yourself, then adjusting to it can be a bit difficult for you. 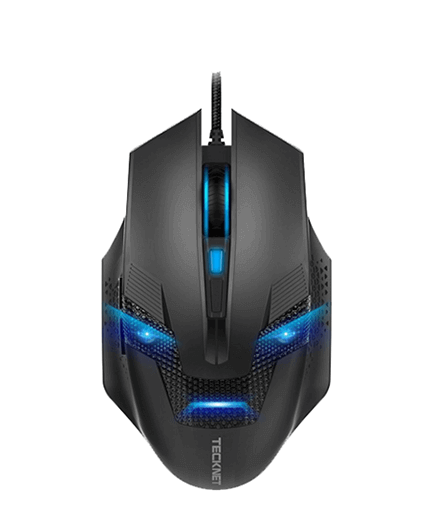 The TeckNet Raptor gaming mouse features integrated 2000 dpi optical gaming sensor, it is not programmable and offers only three variations in the DPI area , that is, 600,1200,2000. It is a low-cost medium quality 6D optical gaming mouse. It isn’t as heavy as I expected earlier, but build quality seems solid. Unlike many others so called cheap gaming mouse, the Raptor is solid and durable. TeckNet is a reputable company known for computer accessories. 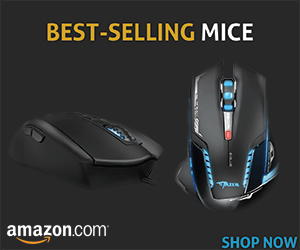 They also offer 18 months warranty for Raptor M268, and you might very much find yourself in a position asking for a replacement, most gamers complain that the mouse begins to develop a slight problem of randomly disconnecting , which is not really a problem when simply browsing , but in between a CSGO firefight , the five second non-usability of the mouse is the fastest way it finds itself in the back of my cabinet being locked up. Luckily , TeckNet immediately provides a replacement. The reason for its popularity among gamers is the precision and accuracy it offers at this price. Comparing it to ordinary and cheap gaming mice in the market, the Raptor M268 offers high-accuracy cursor control. It features TeckNet’s own Tru-Wave sensor. Yet, this precision and accuracy come no way near to the professional gaming Mice, which is to be expected . In a nutshell, the only thing that allows TeckNet Raptor to stay in the race is its cheap price, in my opinion, this is one of the best gaming mouse on the market in its price range. It’s just a better option instead of any ordinary or cheap gaming mouse, or when trying to replace an expensive mouse with a cheaper one. Considering performance and features, it might disappoint you, but considering money value, it definitely won’t.